NEW YORK, September 8 – A groundbreaking and potentially historic step forward has been taken by immigrant workers in NYC’s food industry with today’s announcement by the Hot and Crusty Workers Association (HCWA) that bakery workers on Manhattan’s Upper East Side have prevailed against an employer lockout aimed at stopping their unionization drive. At a spirited rally today in front of the store, union activist Mahoma López said the workers are slated to return to work with union recognition–and a new twist that elated many of the labor and student activists present. Chanting “Trabajadores sí, explotadores no” (Workers yes, exploiters no), workers at today’s rally expressed their determination to consolidate a solid union victory that can serve as an inspiring example to the many thousands who face starvation wages, employer abuse and anti-immigrant discrimination in “deli-sweatshops” throughout the city. López noted that the old owner, Mark Samson, closed the store on August 31 thinking that “we wouldn’t take any action” against his attempt to bust the union. Instead, workers refused to accept the closing, and that same afternoon a group of their supporters carried out a brief occupation, which lasted until police arrived, arrested Laundry Workers Center (LWC) activist Nastaran Mohit and five others, and chained the store closed. Workers then began daily pickets in front of the store, together with supporters active in area unions (TWU, AFSCME, SEIU, PSC and others), as well as a number of activists from the Occupy movement. Bringing students and faculty/staff union activists to the picket line daily, the Internationalist Clubs at nearby Hunter College and other campuses of the City University of New York have carried out intensive leafleting and class announcements to mobilize support for the Hot and Crusty workers. With a long history of struggles in the food, garment and construction industries, immigrant worker supporters of the Internationalist Group, as well as a Class Struggle Education Workers organizer, have been working with HWCA and LWC activists for the objective of a solid union victory. In an interview with the Advocate, López–who has worked at the store as a “deli counter man” for seven years–noted that the workers started organizing in August 2011. Fed up with workweeks of up to seventy-two hours, below-minimum pay and massive “wage theft” by the employer, they contacted the state Department of Labor–“but the Labor Department never showed up and we were facing many reprisals from the owner, who tried to get us to quit our jobs.” We “got tired of waiting, and a compañero suggested we get in touch with Virgilio [Aran] of the Laundry Workers Center.” The LWC helped them get legal representation and begin organizing the Hot and Crusty Workers Association. Several workers eventually won settlements for back wages, and in May 2012 – despite an anti-union campaign filled with dirty tricks and intimidation tactics–the HCWA won a union representation election. Instead of trying to get workers hired at other outlets in the Hot and Crusty chain, the owner of the 62nd Street store and the store’s manager “just wished us ‘good luck’” in finding another way to support their families. Their cynical confidence that the workers would walk away from the fight backfired when the union activists and supporters mounted the determined counteroffensive that led to the tentative settlement announced today. The workers’ struggle has no borders–“La lucha obrera no tiene fronteras,” as Hot and Crusty workers and their supporters chanted today. Earlier this week, in a Hunter College class on Mexican History, one of the bakery workers moved students with his account of how repression by the Migra immigration police, together with years of ruthless exploitation, led to his concientización (becoming class conscious) and determination to see the unionization campaign defeat the employers’ “humiliation and abuse of those who produce everything they sell.” A dozen students signed up on the spot to help support the workers and their union drive. At the CUNY Graduate Center, the Internationalist Marxist Club kicked off the Fall semester with an event where Mahoma López drew enthusiastic applause when he related Hot and Crusty workers’ fight against anti-immigrant oppression to the theme of workers’ struggle against racism shown in the film being shown that night, Finally Got the News (a 1970 documentary on radical black worker organizing in Detroit auto plants). Again, many of those present got involved in the campaign, some coming out to the picket line the next day. At today’s rally, Hot and Crusty workers gave powerful speeches focusing on the lesson that workers can and must organize collectively. “If we stick to the struggle and don’t give up, we can win,” one declared. A member of Transport Workers Union Local 100 drew cheers when he recalled that “we shut the city down” in 2005, stating that the enormous potential power of the New York labor movement should be used to support immigrant workers’ struggles. “Workers and students, shut the city down!” responded the crowd. Hunter College adjunct professor and CSEW member Sándor John read solidarity greetings from Bay Area International Longshore and Warehouse Union militant Jack Heyman (see below). Noting that the ILWU’s historic 1934 strike won the union hiring hall on the docks, Heyman greeted the news that Hot and Crusty workers had gained an agreement promising union control of hiring at the bakery. Loud cheering broke out at the statement’s call: “The workers movement must unite us all and defeat any attempt to divide or discriminate against our brothers and sisters on the basis of immigration status; we don’t care one bit if a worker has papers, we are part of the same working class here and all over the world. Indeed, the experience of campaigns to organize superexploited immigrant workers in the multifaceted NYC-area food industry – from Union Square-area deli/greengrocers to the Burritoville and Pick A Bagel chains, the Flam warehouses of Brooklyn and the 11-month strike at Stella d’Oro in the Bronx – has shown over and again the need to mobilize the numbers and strategic power of the workers movement here. (See, for example, “New York Greengrocer Union Drive at the Crossroads,” The Internationalist No. 12 [Fall 2001]; “Immigrant Restaurant Workers Face ‘Inhuman Exploitation,’” Revolution No. 2 [October 2004]; and “Lessons of the Battle for Stella d’Oro,” The Internationalist No. 30 [November-December 2009]). “New York is a union town” is a popular chant at labor rallies, but that potential power is stifled by the labor bureaucrats who showed yet again at today’s Labor Day parade that they see their mission as eternally subjugating labor to the Democratic Party. This is the same capitalist party that at this very moment is leading attacks on unionists like the teachers facing dictatorial anti-union Chicago mayor Rahm Emanuel, former chief of staff to Barack Obama (whose White House leads the assault on public education at the same time as it reaches new records in the number of immigrants deported each year). Labor officialdom’s reliance on Democratic politicians, the bosses’ National Labor Relations Board and powerless consumer boycotts leads to bitter defeats and sellouts. For two summers running NYC workers have gotten shafted by their “leaders”: Verizon workers were left in the lurch last year when union tops cut short a bitter two-week strike without winning a contract; and many Con Ed workers are still steaming over the two-tier contract shoved down their throats after a 26-day lockout by the profit-mad energy giant. As an Internationalist placard stated at today’s rally: “Luchar con reglas del patrón es segura perdición” – roughly, “If you play by the bosses’ rules, you’re sure to lose.” Instead, a class-struggle leadership would fight to unchain labor’s power and bring it to bear in the fight for immigrant rights, including the kind of militant tactics (mass pickets, “hot-cargoing” scab products, factory occupations) that built the unions in the first place. Above all, this is a political fight for the working class to break from the Democrats and all capitalist politicians, and build its own class-struggle workers party. Full citizenship rights for all immigrants, organizing the unorganized, and expropriating the exploiting class once and for all through a workers government are crucial aspects of the program for building that party. Hot and Crusty dishwasher Margarito López told the Advocate that “After six years of mistreatment, disrespect of the minimum wage – theft of our wages – I am one of those who participated in the fight to have our rights as workers recognized and respected. The bosses said they couldn’t, or wouldn’t, negotiate, and that we could walk out the door and not come back if we didn’t like it. After our efforts and appealing to the Labor Department – which never showed up – my compañeros and I launched the campaign. 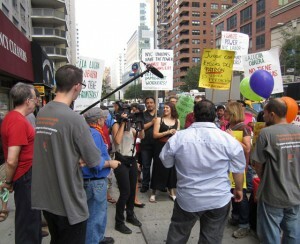 Hunter College and CUNY Graduate Center students joined Hot and Crusty picket lines. We’ve heard about your victorious struggle in New York for union recognition at the Hot and Crusty bakery and felt compelled to send our solidarity greetings. We, in the International Longshore and Warehouse Union, went through a similar struggle during the Great Depression of the 1930’s and one of our union leaders was Harry Bridges, himself an undocumented worker. Following the 1934 general strike here in San Francisco and the port shutdown of all West Coast ports, longshoremen and seamen won the demand for recognition of our union, and union control of hiring through our dispatch hall. Activists from the Internationalists at CUNY have been keeping us informed about your efforts and gave us the exciting news that you are now winning union control of hiring. This is very important. When longshore workers shut down all 29 West Coast docks on May Day 2008 against the war in Iraq and Afghanistan, the call to defend immigrant rights was also raised. Immigrant workers play an important role on the docks too, especially as port truckers in many areas. The workers movement must unite us all and defeat any attempt to divide or discriminate against our brothers and sisters on the basis of immigration status, we don’t care one bit if a worker has papers, we are part of the same working class here and all over the world. Your struggle is happening in the midst of a capitalist crisis in which the politicians of both parties are trying to put the onus for their economic crisis on the backs of workers. Yours struggle can be an inspiration to all workers in the biggest city in this country: IF WE FIGHT TOGETHER IN SOLIDARITY AGAINST THE BOSSES AND THEIR GOVERNMENT – WHETHER IN THE PRIVATE OR PUBLIC SECTOR –WE CAN ALL WIN!